Whilst googling for something totally unrelated, I came across this article in the The Maitland Mercury & Hunter River General Advertiser (New South Wales, Australia) for Thursday 16 September 1869; and I thought it was interesting so I thought I would share it. "A German journal, Die Tribune, relates that M. Mende, a banker of Leipzick (Leipzig, Germany), received a few days back a registered letter from the house of Hachette and Masson, of Paris, for whom he had for some time past acted as agent in Saxony, announcing that their cashier had absconded with securities valued at 200,000 francs. The writers added that the delinquent was known to have taken refuge at the Hotel de Prusse, in Leipzick, and enjoining M. Mende to endeavour to recover the papers without too much scandal and that in case of a voluntary restitution they had compassion on the wife and children whom the culprit had left behind, and were therefore willing to advance him a sum of 20,000 francs on condition he would take himself off to America. M. Mende, thus instructed,went to breakfast at the table d'hôte of the Hotel de Prusse, and observing a gentleman whose appearance corresponded with the description sent, lost no time in making his acquaintance. A sort of intimacy being soon established, the stranger asked M. Mende for the address of any banker that would discount some bills for him. "l am a banker, sir, and will do it myself," said the other. The parties then proceeded to the office of the latter, when M. Mende locked the door, and said to the stranger :" You are a rogue. You have stolen these securities from the house of Hachette and Masson. Your chiefs are, however, generous men. Restore all the papers, and they have commissioned me to hand you 20,000 francs to enable you to fly to America. Here they are go and get yourself hanged elsewhere." The conditions were, of course, accepted, and the other left the room apparently in great emotion. On M. Mende informing the Paris firm of what had transpired, he learnt to his great annoyance that he had been played on by some artful swindlers, as Hachette and Masson had not lost any money, and had never sent him any telegram on the subject." 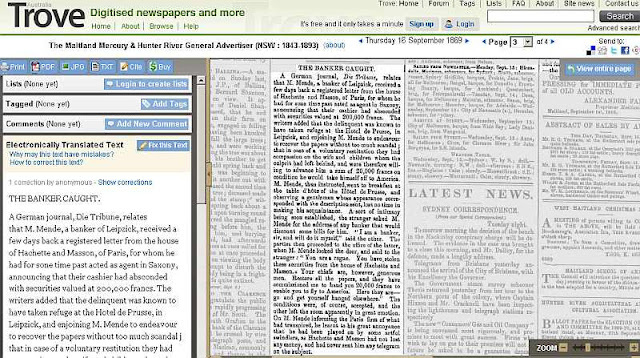 I got the text at TroveAustralia; a really useful resource set up by the National Library of Australia. I've been looking especially at their huge collection of digitised newspapers; however, they offer other resources too. 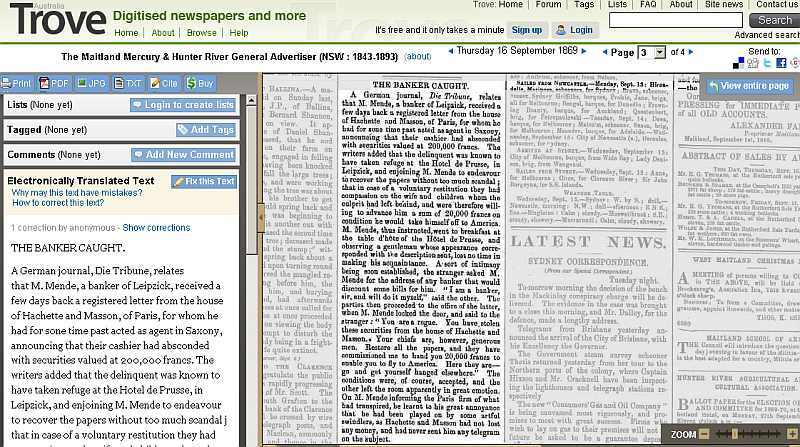 If you click on a newspaper article, you can view the text in a copyable form, and even add corrections; as the text is produced automatically by optical character recognition (OCR) there are likely to be errors. Trove is certainly one of Australia's treasures. Have found a few mentions of William Purves Gowans from Hawick in the newspapers. Thanks for your comment. Are there any other treasures in Australia that you would recommend to family historians with connections to Australia ? Is William Gowans related to the Gowans that were clockmakers in Galashiels ? I think I saw James Gowan on a clock face recently. Fiona, Yes James the clockmaker was his grandfather. We recently purchased a Gowans clock and had it shipped to Australia. These are new to me. I'll have a look at them when I have more time.